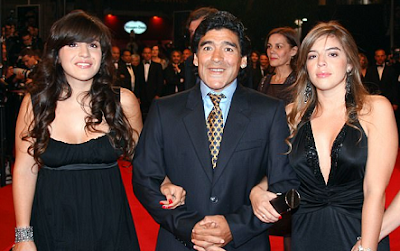 Diego Maradona has accused his two daughters of stealing £3.4million from him and has called for one of them to be jailed. The Argentine World Cup winner also accused his wife of being involved in the alleged theft, alleging they stashed some of the money in Uruguay. The 57-year-old football legend is suing ex-wife Claudia Villafane and daughters Dalma and Giannina. The former Barcelona player says his family transferred stolen cash to a bank account in Uruguay and also used his money to buy up property in the USA. Now Maradona's lawyer claims 28-year-old Giannina was in Uruguay for a 'few hours' in August, according to Spanish sports news outlet Marca. The lawyer said: 'I say to you that she has an account in Uruguay, her child takes the money and puts it into another. Giannina responded to the allegation on Twitter, saying: 'They know where I live and they can come when they want. Ms Villafane - who stands accused of masterminding the alleged fraud - was married to Maradona from 1998 to 2003. The footballer - who also played for Napoli and Boca Juniors - retired from playing in 1997. He now manages Fujairah SC football club in the United Arab Emirates.